Back in the day, Queen was among rock&apos;s flashiest and most popular bands. Featuring the late Freddie Mercury, a flamboyant and angel-voiced singer, and Brian May, a nimble and distinctive-sounding guitarist, the group was equally adept performing hard-driving, anthemic, head-banging songs as it was piano-driven, lushly produced ballads (which were equally on display in one of its most popular tunes, "Bohemian Rhapsody"). With its odd, but compelling pastiche of opera, cabaret, glam rock, and other visually driven genres, Queen was also one of rock&apos;s most theatrical bands. So, it only makes sense that theater should pay homage to the band, which it has been doing for the past decade in the London-based show, We Will Rock You. 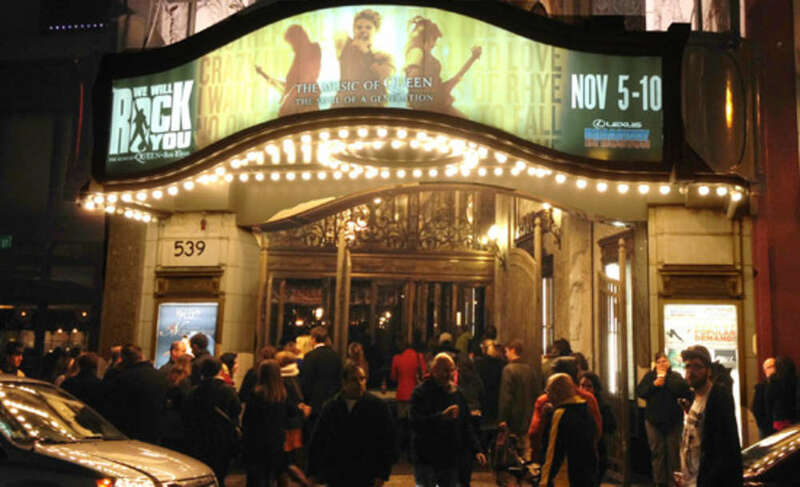 Touring productions of the rock theatrical have made their way around the world but only arrived in North America this fall. I got to see the show during its run at the Boston Opera House. The story takes place in an oppressive, dystopic future where musical instruments are forbidden, and rock music has f-f-faded away. The outcast hero, Galileo Figaro, meets up with like-minded comrade and eventual love interest, Scaramouche. They hit the road and band together with would-be rocker rebels, the Bohemians, to restore freedom and fight for our right to party and rock out, man. Rather than creating new songs or re-jiggering existing ones, the production cobbles together 24 Queen tunes, some of which work ("I Want to Break Free" and "Somebody to Love," for example) and many of which seem, well, cobbled together. That&apos;s an inherent problem with so-called "jukebox musicals." The story can be laughable at times, such as when a statue of Mercury comes to life, with his green eyes flashing, to lead the heroes on their holy-grail quest for the world&apos;s last remaining guitar. And the jokes are often on the level of a throwaway situation comedy. The most head-scratching offense, however, is that the show is based in a world where rock music, face-melting guitar solos, and individual creativity are forbidden. The entire story, however, is conveyed through rock music with face-melting guitar solos and performed by a cast with considerable individual creativity. But, as Mercury so aptly put it, nothing really matters to me. The show more or less works, because the music is so infectious. The band is spot-on, right down to the guitarist&apos;s May-like fretwork and tone. While the vocals are delivered somewhere in between the Ready Freddie originals and Broadway style, the cast is wildly talented and winning. The lead performers portraying Galileo and Scaramouche are particularly magnifico, and the gentleman playing the leader of the Bohemians nails the heartbreaking "These Are the Days of Our Lives." The show might work better if it just did away with the silly story and presented a revue of Queen songs. That is essentially what We Will Rock You is anyway. The sets, the sound, the impressive projected media, the choreography, the rock concert-like lighting, and the rest of the production are all top-notch. Avid and casual Queen fans should enjoy it. The Boston Opera House, which is accustomed more to The Marriage of Figaro rather than Queen&apos;s Galileo Figaro, is positively stunning and a great venue to see a show like this. The glitzy Mercury surely would have approved of its ornate gold leaf and gilt edges.